Over the weekend, I went to Sarasota with my Mom. We went to the lovely shops that create St. Armand's Circle and spent the day window shopping and snacking. I haven't been to this area in such a long time, and I was thrilled to go again because I don't live close by. You might have seen my Instagram post about the Lilly Pulitzer store we went into. It was the cutest store! I love living in Florida and one particular room was dedicated to showing off the state! My outfit features a new dress from Goodwill. It is a GAP plaid dress that cinches at the waist which makes it flattering and perfect for when I want to eat a lot. 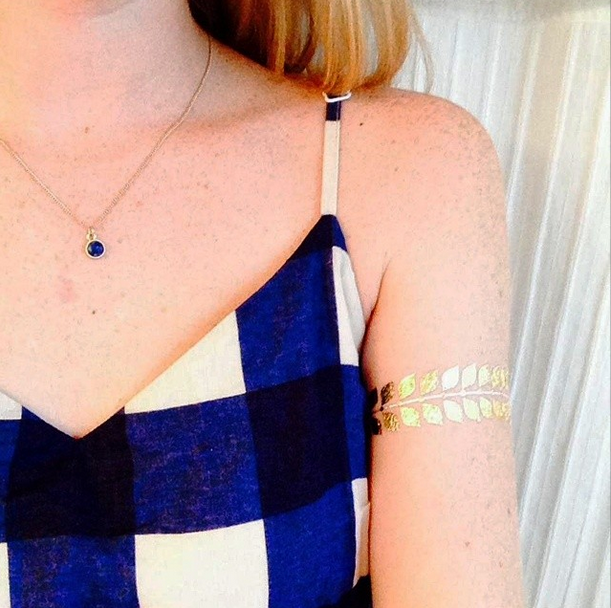 I also bought some Flash Tattoos, which are by far the coolest summer trend for 2014. I've seen celebrities wear these for festivals and I wanted to try them out so badly! One of the local beach shops sold these and I have been experimenting with them while I recover from wisdom teeth surgery. The fact that they are shiny and gold makes me love them ever more. I hope I don't go too overboard! Thanks for reading! I will hopefully be posting more outfits once I leave my house, but look forward to a haul of some sort in the near future.